Download "Fact Sheet 15-13 UPDATED January 2016"
1 UPDATED Fact Sheet Annual Professional Performance Review (APPR) January 2016 Page 1 ANNUAL PROFESSIONAL PERFORMANCE REVIEW (APPR) Fact Sheet UPDATED January 2016 The 2015 state budget included replacing the current Annual Professional Performance Review (APPR) law section 3012-c of the Education Law with a new section 3012-d. The state budget also included language that requires districts to have new APPR plans approved by the State Education Department (SED) by November 15, 2015 in order to receive the district s scheduled increase in state aid for the school year. The new APPR law gave SED authority to make important decisions about implementation of the law through commissioner s regulations. The following is an overview of the new law and SED s regulations that were adopted by the Board of Regents through emergency action on June 15, 2015, as well as revisions to the regulations adopted by the Board of Regents through emergency action on September 16, 2015 and again on November 9, On December 15, 2015 the Board of Regents voted to implement a four year moratorium on the consequences of using the 3-8 ELA and math Common Core State Assessments, in any form, and state-provided growth scores on Regents exams in teacher and principal evaluations. The revisions contained in this APPR Fact Sheet update involve the new transition regulations. The new regulation replaces APPR ratings containing outcomes from these assessments/metrics with a transition rating. During the transition period only the transition rating will be used for purposes of APPR (3012-c or d) employment decisions, including tenure determinations and for purposes of proceedings under Education Law 3020-a and 3020-b and teacher and principal improvement plans and a teacher s official employment record. During the transition period State-provided growth scores will continue to be computed for advisory purposes and overall HEDI ratings compliant with the districts approved APPR plan will continue to be provided to teachers and principals. It is important to note that the December 15 Regents transition period decision does not change the requirement to negotiate an APPR plan compliant with 3012-d by September 1. It does however, give districts some relief in that the Department is granting an automatic renewal of existing Hardship Waivers for all districts currently implementing a 3012-c plan under a waiver. SED has released a FAQ that addresses questions relating to the transition ratings. The FAQ can be found at the following link: Transition Rating (NEW) Districts operating under 3012-c For the school year for districts that have received a hardship waiver and are operating under 3012-c, the transition rating will be determined based on the remaining subcomponents of the APPR that are not based on the grade 3-8 ELA or math State assessments and/or a State provided growth score on Regents examinations. 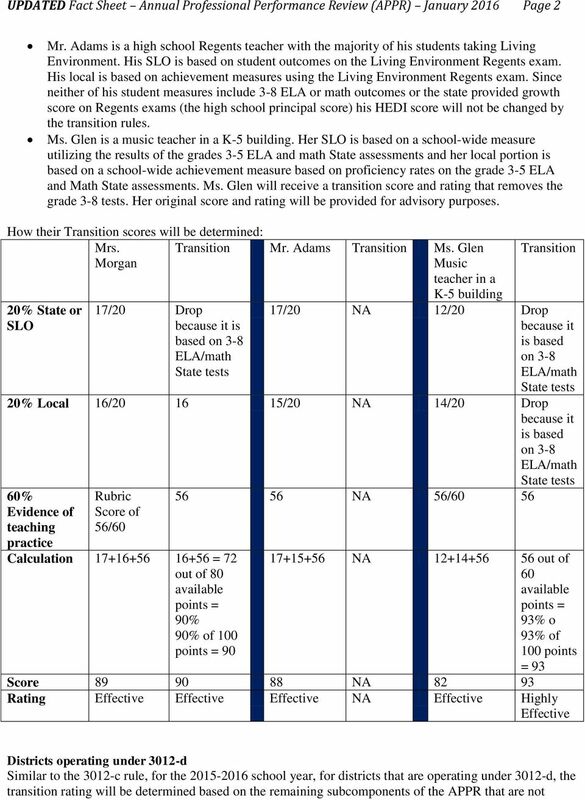 The following three examples illustrate how the Transition Rating will be determined: Mrs. Morgan is a 5th grade Common Branch teacher, she receives a growth score from the state based on her student s ELA and Math State assessments and her local portion of the APPR is based on student achievement outcomes on a third party assessment. Mrs. Morgan will receive a transition score and rating that removes the grade 3-8 tests. Her original score and rating will be provided for advisory purposes. 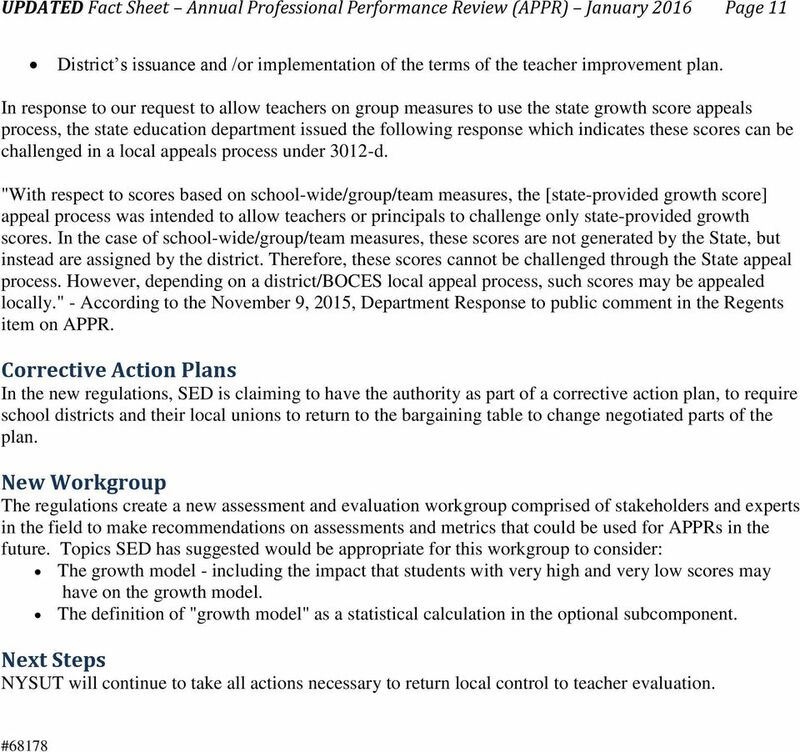 4 UPDATED Fact Sheet Annual Professional Performance Review (APPR) January 2016 Page 4 Growth because it utilizes the high school building s state provided growth score Teacher Observation Calculation Rubric Score of 3.4 = Student = 18 and 16 combined with the locally negotiated 50%/50% weighting = 17 = and 3.4 =, apply to matrix 3.4 = Apply the resulting student and the teacher observation to Matrix 3.4 = Student = 18 and 16 combined with the locally negotiated 50%/50% weighting = 17 = and 3.4 =, apply to matrix 3.4 = Apply the resulting Highly student and the teacher observation to Matrix Rating Highly 3.4 = Student = 15 and 17 combined with the locally negotiated 50%/50% weighting = 16 = and 3.4 =, apply to matrix because it is based on 3-8 ELA/math 3.4 = Apply the resulting student based on the Alternate SLO and the teacher observation to Matrix TIMELINE Putting together a timeline requires combining dates from the law, regulations and the waiver process. Below is the timeline based on the dates from the three sources. Application of the new law begins with evaluations. 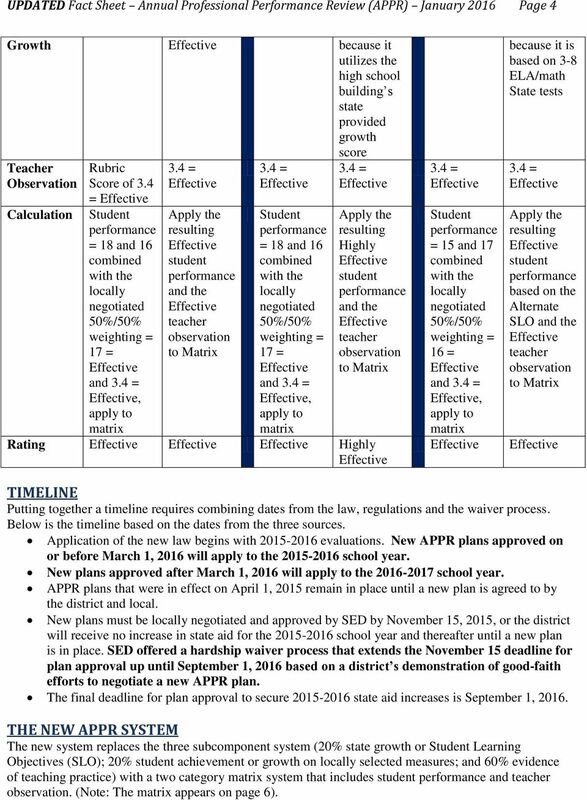 New APPR plans approved on or before March 1, 2016 will apply to the school year. New plans approved after March 1, 2016 will apply to the school year. APPR plans that were in effect on April 1, 2015 remain in place until a new plan is agreed to by the district and local. New plans must be locally negotiated and approved by SED by November 15, 2015, or the district will receive no increase in state aid for the school year and thereafter until a new plan is in place. SED offered a hardship waiver process that extends the November 15 deadline for plan approval up until September 1, 2016 based on a district s demonstration of good-faith efforts to negotiate a new APPR plan. The final deadline for plan approval to secure state aid increases is September 1, THE NEW APPR SYSTEM The new system replaces the three subcomponent system (20% state growth or Student Learning Objectives (SLO); 20% student achievement or growth on locally selected measures; and 60% evidence of teaching practice) with a two category matrix system that includes student and teacher observation. (Note: The matrix appears on page 6). 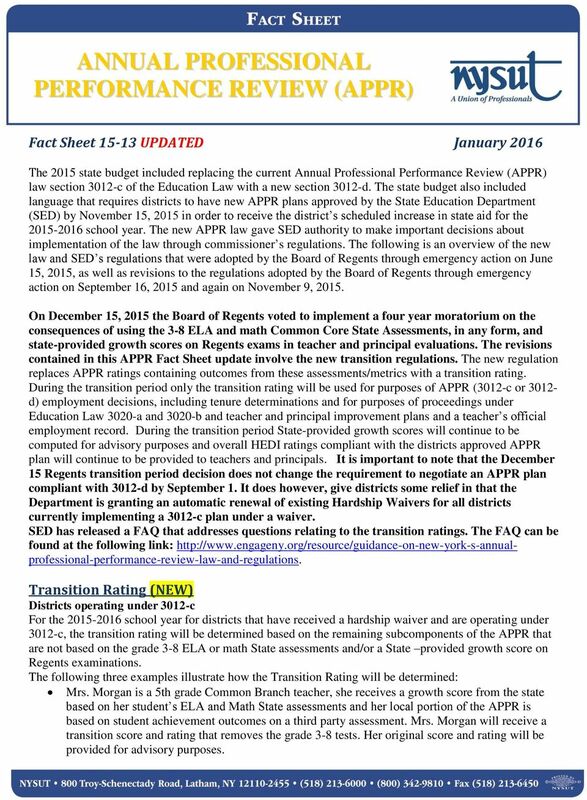 5 UPDATED Fact Sheet Annual Professional Performance Review (APPR) January 2016 Page 5 APPR Plan Requirements The regulations require districts to submit the APPR plan to SED for approval. The plan must describe: The district s process for submission of data; How the district will report individual teacher scores and ratings; The assessment development, security and scoring processes utilized by the district; The details of the district s evaluation system; and How the district will provide timely and constructive feedback to classroom teachers on their APPR. Student Performance Category The student category has one required and one optional subcomponent. State growth is a required component, and a second assessment selected through collective bargaining is an option. Here is how it will look for the two types of teachers: Grade 4-8 Common Branch, ELA and Math Classroom Teachers: Continue to receive a State-provided growth score based on the growth model; and all of these teachers will also be required to have a back-up SLO in place in case the state cannot produce a growth score. Optional second state-provided growth score on a state-created or administered test provided it uses a different measure, or a supplemental assessment selected from SED s approved list. All Other Classroom Teachers: Continue the Student Learning Objectives (SLO) process with either a state assessment or state approved assessment. SED has posted an RFQ for SLO assessments; currently approved assessments do not automatically meet the new SED requirements. Optional second state-provided growth score on a state-created or administered test provided it uses a different measure, or a supplemental assessment selected from SED s approved list. SLO Target Setting Superintendents or their designees have sole discretion to use pedagogical judgment to determine SLO targets. The current process for target setting in the plans may be continued. These targets must reflect a year of expected growth, which can vary by a student s academic preparedness (i.e., prior achievement) and learning needs (i.e., economic disadvantage, disability, English language learner status). This means targets can factor in these characteristics. SLOs may incorporate group measures, including school-wide measures. Optional Locally Selected Measure or Assessment Subcomponent Use of an optional second measure must be agreed to through collective bargaining and can be a growth measure based on existing state exams or on new assessments approved by the state. The decision on which measure or assessment to use is also collectively bargained. Under the regulation, many of the group measures based on state assessments currently used in the local subcomponent will be available for use as this optional subcomponent. During the transition, these measures cannot be used. Achievement measures are not allowed at this time. Currently, the SED definition of a growth model narrowly defines it as a statistical model. Some examples of measures or assessments for this subcomponent are: Measure computed by the state of the percent of students who achieve a state-determined level of growth on a state assessment. 6 UPDATED Fact Sheet Annual Professional Performance Review (APPR) January 2016 Page 6 State-calculated school-wide results based on the state provided growth scores of all students in the school taking the 4-8 state ELA or math assessment. Locally computed school-wide results based on all or a subset of state provided growth scores. Locally selected, state-designed supplemental assessment with a state-provided or approved growth model. o These would be locally negotiated and come from a state provided list of assessments. o SED has posted an RFQ for supplemental assessments; currently approved assessments do not automatically meet the growth model requirement. o If a teacher is rated ineffective on the student category and a supplemental assessment is used as the optional student growth component, then the teacher can be rated no higher than ineffective overall. (Note: If one of the first three options above is used in this subcomponent this provision does not apply). Calculating a Student Performance Rating The law gave the Board of Regents the authority to set weights for the two subcomponents of the student category, combining the scores into one rating and determining how teachers receive a rating of Highly,, Developing or Ineffective. 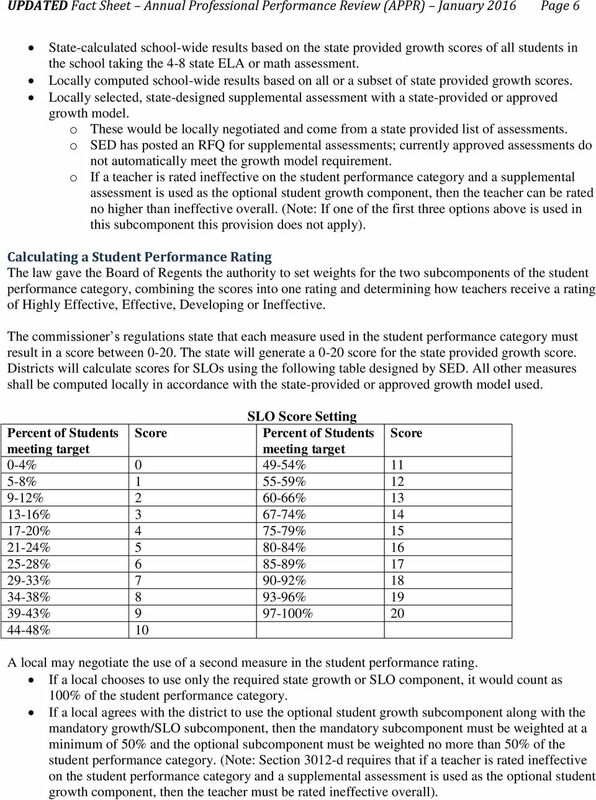 The commissioner s regulations state that each measure used in the student category must result in a score between The state will generate a 0-20 score for the state provided growth score. 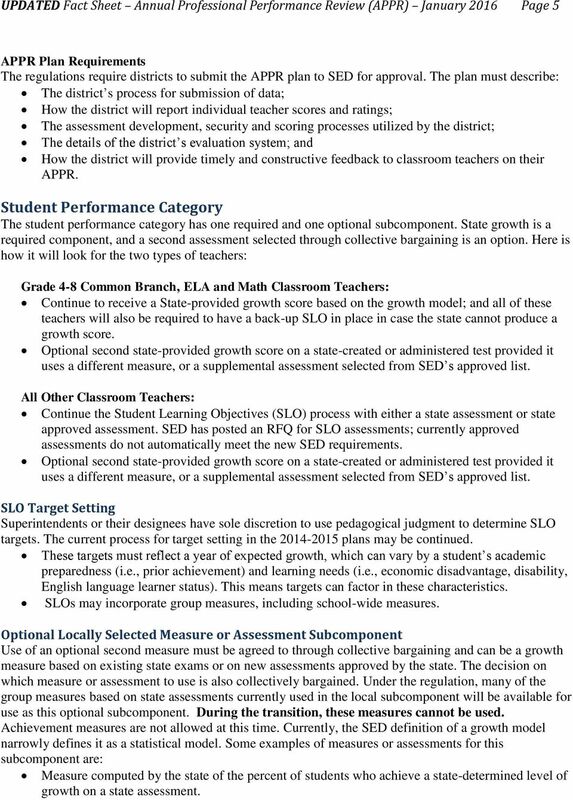 Districts will calculate scores for SLOs using the following table designed by SED. All other measures shall be computed locally in accordance with the state-provided or approved growth model used. SLO Score Setting Percent of Students Score Percent of Students Score meeting target meeting target 0-4% % % % % % % % % % % % % % % % % % % % % 10 A local may negotiate the use of a second measure in the student rating. If a local chooses to use only the required state growth or SLO component, it would count as 100% of the student category. If a local agrees with the district to use the optional student growth subcomponent along with the mandatory growth/slo subcomponent, then the mandatory subcomponent must be weighted at a minimum of 50% and the optional subcomponent must be weighted no more than 50% of the student category. (Note: Section 3012-d requires that if a teacher is rated ineffective on the student category and a supplemental assessment is used as the optional student growth component, then the teacher must be rated ineffective overall). 7 UPDATED Fact Sheet Annual Professional Performance Review (APPR) January 2016 Page 7 An overall score of 0-20 shall be generated for the student category. If an optional second measure is used, the two scores will be combined using a weighted average to produce an overall score. Overall Student Performance Category Score and Rating Rating Minimum Maximum Highly Developing Ineffective 0 12 Teacher Observation Category The new law requires a minimum of two observations: one by a principal or other trained administrator, and another by an impartial independent trained evaluator. If locally negotiated, observations by trained peer observers are also allowed. Independent evaluators must be trained and selected by the district: o May include other administrators, department chairs, or peers (such as teacher leaders on career ladders). o Cannot be from the same school building as the teacher being observed but may be from another school in the district (same building is defined as same BEDS code). o Hardship waivers may be available for rural schools and one-building districts. Peer evaluators must have been rated effective or highly effective on his/her overall rating the prior school year and can be from the same school or another school in the district. Commissioner s regulations allow for local flexibility on frequency and duration of observations. Plans may exceed the minimum of two observations. All of these procedures must be collectively bargained. Commissioner s regulation requires one observation to be unannounced. Videotaped observations are allowed but must be collectively bargained. 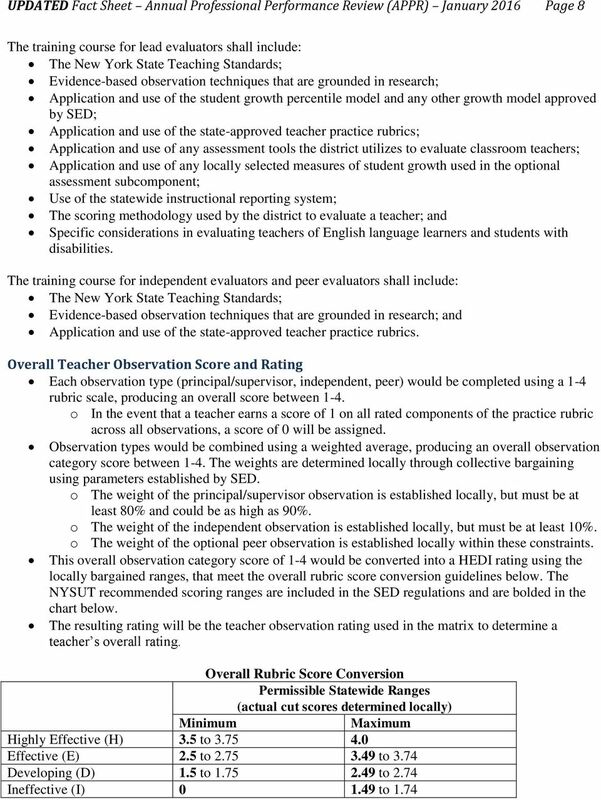 Teacher Practice Rubrics The selection of the teacher practice rubric to be used in the teacher observation category must be locally negotiated from a menu of state-approved rubrics. The currently approved list of rubrics will remain available until the new menu is issued. All observations for a teacher for the school year must use the same approved rubric. However, the parties may locally negotiate whether to use different rubrics for teachers who teach different grades and/or subjects. 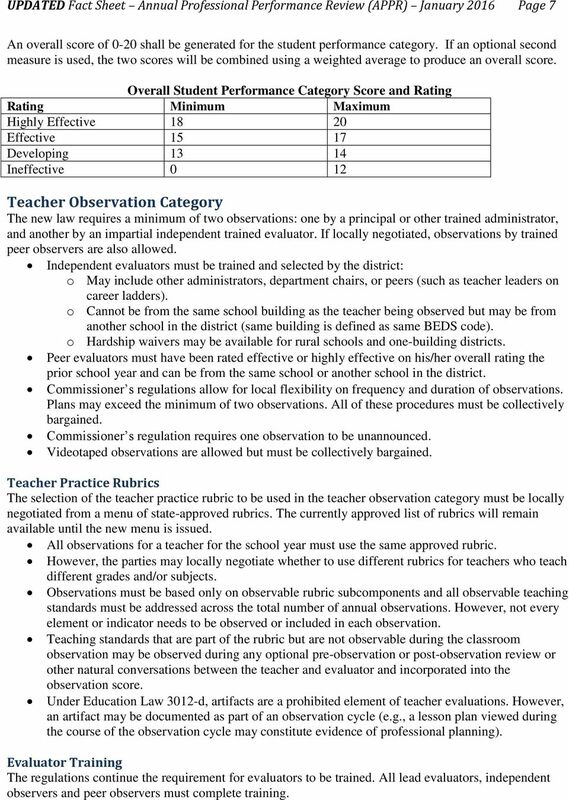 Observations must be based only on observable rubric subcomponents and all observable teaching standards must be addressed across the total number of annual observations. However, not every element or indicator needs to be observed or included in each observation. Teaching standards that are part of the rubric but are not observable during the classroom observation may be observed during any optional pre-observation or post-observation review or other natural conversations between the teacher and evaluator and incorporated into the observation score. Under Education Law 3012-d, artifacts are a prohibited element of teacher evaluations. However, an artifact may be documented as part of an observation cycle (e.g., a lesson plan viewed during the course of the observation cycle may constitute evidence of professional planning). Evaluator Training The regulations continue the requirement for evaluators to be trained. All lead evaluators, independent observers and peer observers must complete training. 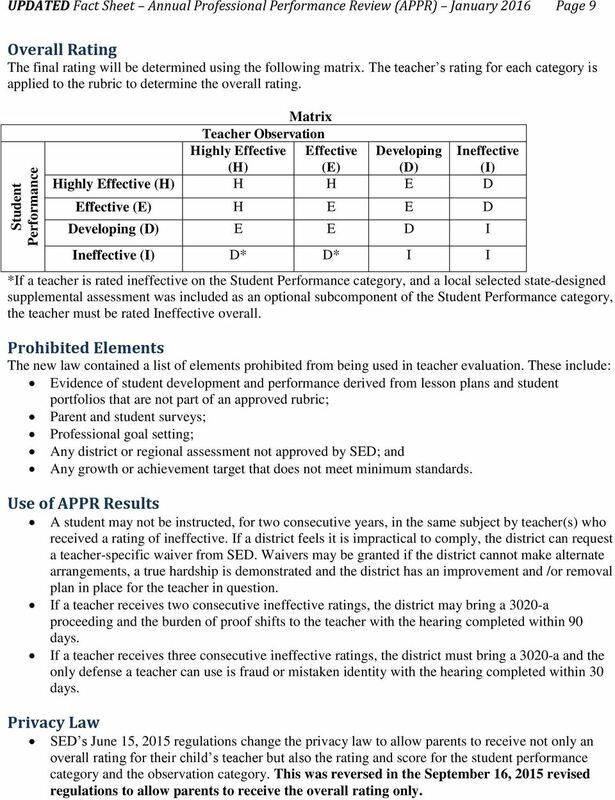 9 Student Performance UPDATED Fact Sheet Annual Professional Performance Review (APPR) January 2016 Page 9 Overall Rating The final rating will be determined using the following matrix. The teacher s rating for each category is applied to the rubric to determine the overall rating. Matrix Teacher Observation Highly Developing Ineffective (H) (E) (D) (I) Highly (H) H H E D (E) H E E D Developing (D) E E D I Ineffective (I) D* D* I I *If a teacher is rated ineffective on the Student Performance category, and a local selected state-designed supplemental assessment was included as an optional subcomponent of the Student Performance category, the teacher must be rated Ineffective overall. Prohibited Elements The new law contained a list of elements prohibited from being used in teacher evaluation. These include: Evidence of student development and derived from lesson plans and student portfolios that are not part of an approved rubric; Parent and student surveys; Professional goal setting; Any district or regional assessment not approved by SED; and Any growth or achievement target that does not meet minimum standards. Use of APPR Results A student may not be instructed, for two consecutive years, in the same subject by teacher(s) who received a rating of ineffective. If a district feels it is impractical to comply, the district can request a teacher-specific waiver from SED. Waivers may be granted if the district cannot make alternate arrangements, a true hardship is demonstrated and the district has an improvement and /or removal plan in place for the teacher in question. If a teacher receives two consecutive ineffective ratings, the district may bring a 3020-a proceeding and the burden of proof shifts to the teacher with the hearing completed within 90 days. If a teacher receives three consecutive ineffective ratings, the district must bring a 3020-a and the only defense a teacher can use is fraud or mistaken identity with the hearing completed within 30 days. Privacy Law SED s June 15, 2015 regulations change the privacy law to allow parents to receive not only an overall rating for their child s teacher but also the rating and score for the student category and the observation category. This was reversed in the September 16, 2015 revised regulations to allow parents to receive the overall rating only. 10 UPDATED Fact Sheet Annual Professional Performance Review (APPR) January 2016 Page 10 Teacher Improvement Plans (TIPs) According to the regulations, a district must develop and implement a teacher improvement plan for teachers receiving a rating of Developing or Ineffective from an APPR conducted under section 3012-d by October 1, in the school year following the school year the teacher received the rating. The improvement plan shall be developed by the superintendent or his or her designee in the exercise of their pedagogical judgment and must include at a minimum: Identification of needed areas of improvement; A timeline for achieving improvement; The manner in which the improvement will be assessed; and Where appropriate, differentiated activities to support a teacher s improvement in those areas. Notwithstanding language in the regulations and guidance, the TIP process should not change without the District bargaining any changes with the union. 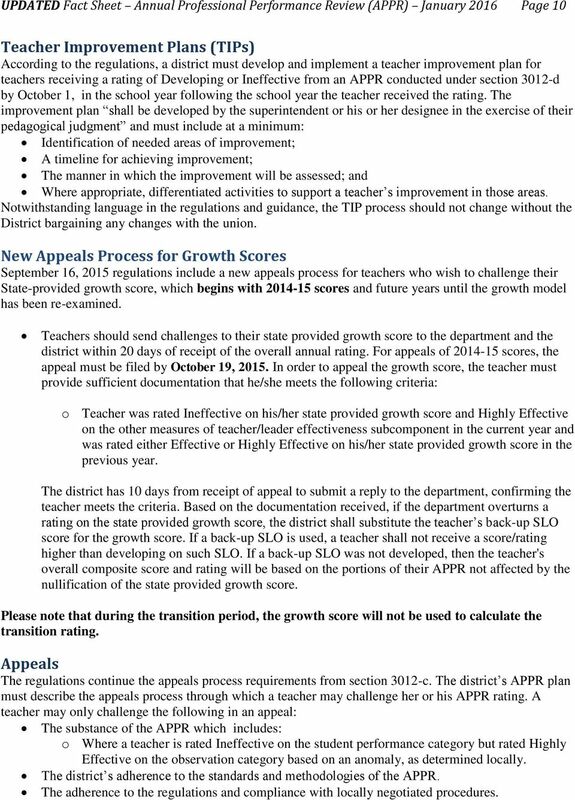 New Appeals Process for Growth Scores September 16, 2015 regulations include a new appeals process for teachers who wish to challenge their State-provided growth score, which begins with scores and future years until the growth model has been re-examined. Teachers should send challenges to their state provided growth score to the department and the district within 20 days of receipt of the overall annual rating. For appeals of scores, the appeal must be filed by October 19, In order to appeal the growth score, the teacher must provide sufficient documentation that he/she meets the following criteria: o Teacher was rated Ineffective on his/her state provided growth score and Highly on the other measures of teacher/leader effectiveness subcomponent in the current year and was rated either or Highly on his/her state provided growth score in the previous year. The district has 10 days from receipt of appeal to submit a reply to the department, confirming the teacher meets the criteria. 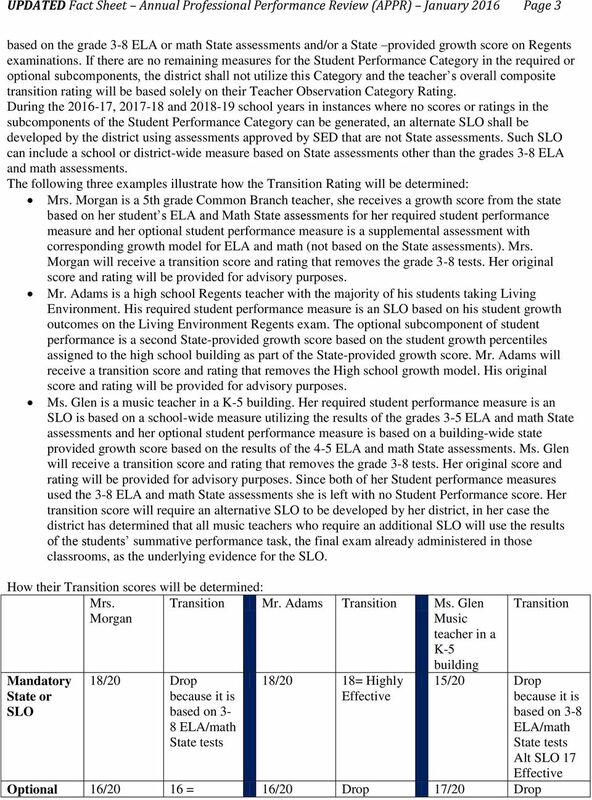 Based on the documentation received, if the department overturns a rating on the state provided growth score, the district shall substitute the teacher s back-up SLO score for the growth score. If a back-up SLO is used, a teacher shall not receive a score/rating higher than developing on such SLO. If a back-up SLO was not developed, then the teacher's overall composite score and rating will be based on the portions of their APPR not affected by the nullification of the state provided growth score. Please note that during the transition period, the growth score will not be used to calculate the transition rating. Appeals The regulations continue the appeals process requirements from section 3012-c. The district s APPR plan must describe the appeals process through which a teacher may challenge her or his APPR rating. A teacher may only challenge the following in an appeal: The substance of the APPR which includes: o Where a teacher is rated Ineffective on the student category but rated Highly on the observation category based on an anomaly, as determined locally. The district s adherence to the standards and methodologies of the APPR. The adherence to the regulations and compliance with locally negotiated procedures.